Parking: Parking is available for $2 in the parking garage at 19th & Harney, courtesy of the Omaha Douglas Public Building Commission (1910 Harney St., Omaha, NE 68102). Parking meters surrounding the theater are active from 9 a.m. to 9 p.m., Monday through Saturday, with free parking available on Sundays and holidays. The Rose is committed to enriching the lives of children and families through live theater and arts education. For nearly 70 years, The Rose has been the hallmark of family entertainment with its selection of outstanding family-friendly performances ranging from beloved classics to original world-premiere shows. Located at 2001 Farnam Street, The Rose is the home to the Omaha Theater Company – the only resident, professional theater in Omaha and one of the largest in the country. The Rose produces nine main stage productions each season that appeal to a wide range of ages starting with children as young as three years old. Each season features popular show titles and a mix of theatrical productions, musicals and interactive theater. The Rose is accessible to all children. “Pay-what-you-can” evenings offered for most productions. Each show is interpreted for the hearing-impaired, and multiple shows are designated “sensory-friendly” for children on the autism spectrum. Teen artists may participate in The Rose’s Teens ‘N’ Theater program where participants act, direct, write, design, stage manage and more in original and scripted productions. Members of The Rose receive four free tickets to the production. Discover the dietary delights and dilemmas of DRAGONS in this fun-filled farce! In this hilarious adaptation of Adam Rubin’s giggle-generating book, we meet Boy—and his faithful fido, Leroy–as they wrestle with a particularly stubborn homework problem. When Mom suggests that they take a break while she runs out to pick up dinner, a sharp-suited spokesperson on the TV suddenly draws Boy and Leroy into a documentary about dragons and their favorite food: TACOS! Before long, they are swept up into the “Dos & Don’ts” of serving tasty treats to big beasts. Fortified with his new dragon knowledge, will Boy make a homework breakthrough? Come join the culinary quest and find out! Join Our Post-Performance Q&A Session! A few minutes after the performance, our actors will conduct a Question & Answer session from the stage. It’s a wonderful opportunity to learn more about the scenery, costumes, special effects, and other aspects of the production. The actors may even have a question or two for you about the story. Meet the Cast & Get an Autograph! Some performers will be available after the show to say hello, pose in pictures, and sign their autographs for you. You can meet them on the mezzanine level right outside the entrance to our balcony level seats. The 2 pm show on Sat, May 4 provides ASL interpretation for the deaf and hard of hearing and audio description services for the blind. The 5 pm show on Sat, May 4 is designated as sensory-friendly show. Contact The Rose Box Office at (402) 345-4849 for more information. Tickets: Teens ‘N’ Theater show tickets are $6 each and available through The Rose Box Office at (402) 345-4849 or at the door on the day of show. Teens ‘N’ Theater show tickets are not available online. 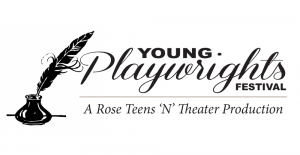 The Young Playwrights Festival showcases the work of some of the best teenage writers in the Omaha area. Most of the scripts featured in this production are created as part of The Rose’s yearlong Young Playwrights class, which is led by The Rose’s award-winning Playwright-in-Residence, Brian Guehring. Written entirely by teens, the works are filled with comedy, tragedy, hopes, fears, romance, and all-out fun. Find your TAG Representative for tickets. Members of The Rose receive discounted tickets to the production. The 2 pm show on Sat, June 15 provides ASL interpretation for the deaf and hard of hearing and audio description services for the blind.